31st May 2018, New Delhi: The Maternity Benefit (Amendment) Act, 2017 was touted as a bold move by the Government. It increased the duration of paid maternity leaves in India from 12 weeks to 26 weeks. But all does not seem fine. Although many congratulated the government for looking out for the welfare of the female workers, the decision might have had a serious impact on the employability and favourability of women, especially when it came to startups and SMEs. 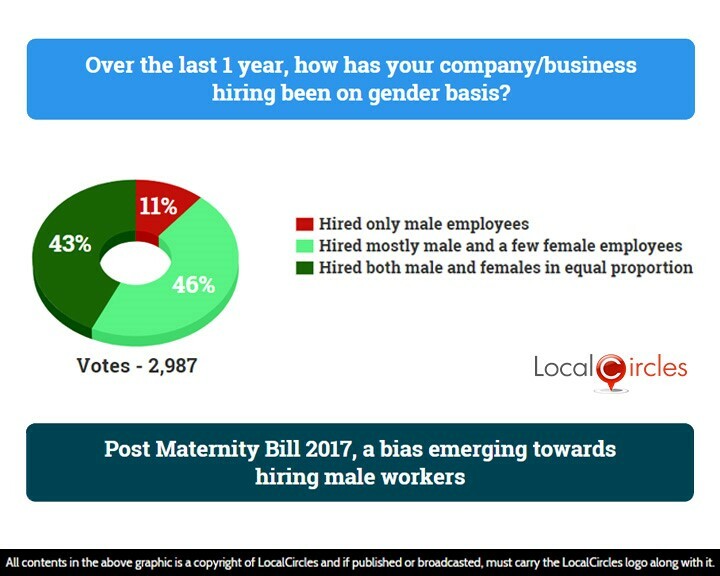 LocalCircles conducted a poll and asked businesses how their company/business hiring has been on gender basis in the last 1 year. 11% said they hired male employees only while 46% said they hired mostly male and a few female employees. 43% said they hired both male and females in equal proportion. This poll received 2987 votes from startups and SMEs across India. There have been reports that over the last year, startups and SMEs have been reluctant in hiring newly married women. India now has one of the world’s most generous maternity leave policy and it is probably the only country where its entire financial burden is supposed to be borne by the employer. For example, Singapore has 16 weeks of paid maternity leave, out of which 8 weeks are funded through various public funds. 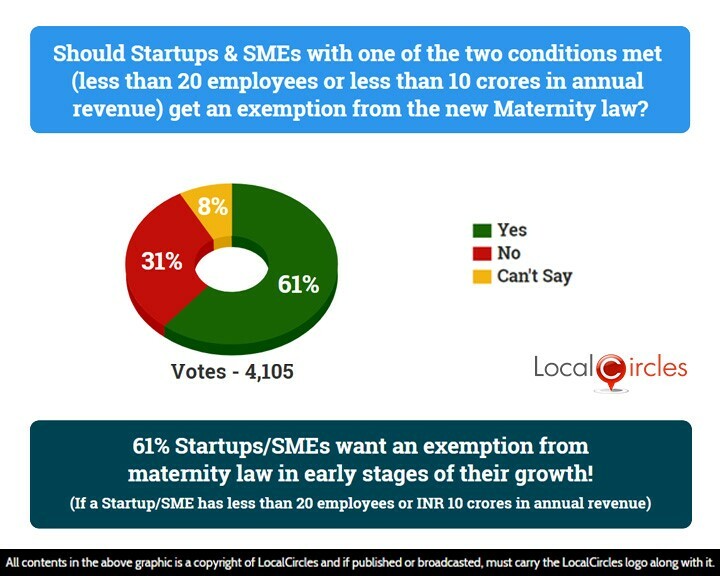 Last year, when the amendment to the maternity bill was made, LocalCircles ran a poll and asked if startups & SMEs with either less than 20 employees or less than 10 crores in annual turnover should get an exemption from the new Maternity Benefits act. 61% respondents agreed with it. 31% voted against it while 8% were unsure. 61% Startups/SMEs want and exemption from maternity law in early stages of their growth! Many startups & SMEs had said that in the times when starting up or running businesses was becoming increasingly tough, the new maternity leave law would put added financial pressure on their workings. In parallel polls, 35% startups & SMEs had said that the new maternity bill will negatively impact their business, while 26% had said that they would now prefer hiring male employees. In female dominated sectors like education, this act does put a lot of strain on the finances of say school. They would need to give a 6-month maternity leave and at the same time, hire another teacher to make sure the study schedule is not hampered along with appropriate transition periods leading to up to 9 months of added salary cost in many cases. LocalCircles will be sharing this report with the Ministry of Labour and Employment and Ministry of Commerce so that the issues can be better understood, and an exemption is considered for startups and SME businesses.